It’s Friday again. 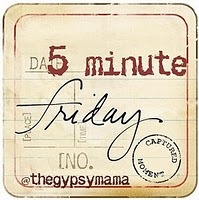 Today I join The Gypsy Mama to write for five minutes on her weekly prompt. No editing or rewriting allowed. Click on the link to her site if you want to try it, too. The prompt this week is “Gift”. I have called this a gift in the past. This feeling of pain over things that have nothing to do with me. I even wrote a poem about it, which maybe I will share sometime. But today, and last night, it doesn’t–didn’t–feel like a gift. It feels like a burden I have to bear almost completely on my own. Because who can I tell? I can’t call up my girlfriends as I do with most things. I don’t want to give them pain, too. I can’t tell them why I’m having a hard day because that would make their day unbearable too. If I were my friend, I wouldn’t want me to share the details of the horrific accident that took a man’s life at the place of my husband’s work. No. Please do not tell me. It is too much. But I already know. I can’t erase it from my brain. And no matter how much I tell myself it doesn’t affect me, I didn’t even know him, I don’t have to walk the path of loss his family is traveling–the pain doesn’t stop. Or only for a little while. So I can only lift it up to the One who shares in the suffering of all of us. And ask Him to give me strength to bear it. Yeah, it’s a heavy week. But I’ll find my way to joy again. Maybe even as I live out this Friday. Thanks for reading. The gift of His strength is one of the greatest gifts of all! Loved your honest words this morning. Praying for you! You can always call me! Jim spared me the details of the accident, which is a blessing and a curse. I don't know exactly what happened so I can't replay it in my mind. But because I don't know what happened, my mind imagines a million scenarios at that big, scary plant. Even though you don't know the man or his family personally, you send your husband there every day and trust he will come home to you at night. It does affect you, plain and simple. Sending hugs your way! "There has been an accident" are words you never want to hear. In my husband's line of work most of those accidents are going to be horrific. Then he had an accident in our home. It is hard to see the gift in the pain at the time but if it makes you more appreciative, if it brings about safety changes or vigilance … if you have a chance to offer comfort (even if just to your spouse) it can become a blessing. Lean on God. He provides the strength. I should call you, Peg. This day is packed, though. Maybe I will find some time. I'm not sure whether knowing the details is better or not. Todd thinks all the safety regulations give people a false sense of security at the plant, they forget it is still dangerous. Not saying that's why it happened. Ultimately, I believe if your time has come your going to go. Just don't know why anyone would have to go that way. So sad. Thank you, snipewife. I appreciate your words of comfort and experience. Vigilance is what I asked my husband to have, last night between my tears . . . "Please don't stop thinking, not for a second." This is the sort of thing I just have to keep offering up to God because I don't understand it. *you're going to go. Argh! I cannot believe I did that!